Bright, sunny lemon cupcakes drizzled with a sweet lemon glaze. I hope these lemon cupcakes with lemon glaze make up for the fact that I skipped Cinco de Mayo yesterday. I had big plans that involved making you a delicious margarita recipe. I wrote my list and headed off to the store with a giddy exuberance I always get when I’m about to create a recipe that involves booze. I walked up to the citrus bin, and I winced. Limes were priced at $.99 each! They were more expensive than the lemons. Um, what gives, limes? I thought maybe it was just that particular store, so I got back in my truck and headed to yet another grocery store. Not only were the limes the same price, but they were small and wrinkled, as if someone stuck a straw in each of them and sucked out all of their juice. After a bit of research (I Googled “high lime prices”), I learned that the lime crops in Mexico are suffering from a bacterium infection. There was no way I was spending a fortune to make a margarita, so I skipped the Cinco de Mayo party. Yeah, you can thank the limes. Today, we’re celebrating Georgia of The Comfort of Cooking and the upcoming birth of her first baby. It’s a girl! What better way to celebrate than with a cupcake. I have no doubt Georgia’s wee one will appreciate a lemon-infused cupcake. 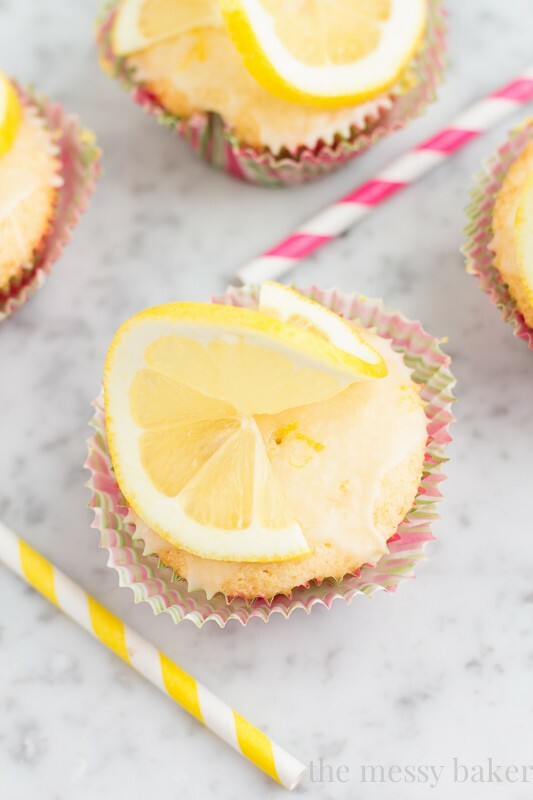 These cupcakes are bursting with lemon. I added the zest of 2 lemons to the batter. I hope you like lemon! The cupcake is moist, tender, and perfectly tart. I wanted the cupcake to remain light and delicate, so I chose to drizzle them with a glaze instead of mounding them with frosting. If you love frosting, these would be perfect with a tart lemon buttercream or lemon cream cheese frosting. 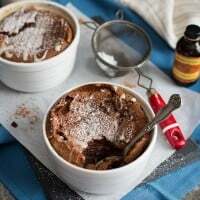 Don’t over beat the batter after adding the dry ingredients. Over beating can cause your cupcakes to sink in the center. Don’t overfill your tins. I find that filling each tin 2/3 of the way full is plenty. If you want to get really scientific about it, you can fill and bake one cupcake to test how high the batter will rise before baking the remaining batches. Lucky for you, I’m here to do your dirty work. I test each and every recipe to ensure you’re getting the perfect cupcake every time. Make sure your oven temperature is precise. Oven thermometers are fairly inexpensive. If you’re serious about baking, I highly recommend investing in one. Always follow the recipe. Baking is a science. Use measuring cups for dry ingredients and a measuring glass for wet ingredients. Always taste test at least two cupcakes before serving… Okay, I may have made this one up. Honestly, the baker deserves a reward for all of their hard work and cupcake efforts. It’s only fair. After the cupcakes come out of the oven, allow them to cool in the pan for 5 minutes. Place a wire rack on top of a piece of wax or parchment paper. Transfer the cupcakes to the wire rack and slowly drizzle the lemon glaze over the warm cupcakes. A slow stream of glaze will allow the warm cupcakes to soak up the glaze. When you bite into the cupcake, you get the crunch from the tart glaze that leads to the moist, pillowy cupcake beneath. A big congratulations to my friend Georgia and the upcoming birth of her first baby. I can’t wait to see pictures! In a small bowl, add flour, baking powder, and salt. Whisk to combine. Set aside. In the bowl of a stand mixer attached with the whisk attachment, cream butter and sugar until light and fluffy, about 3 minutes. Scrape down the sides of the bowl. Add eggs, lemon zest, and vanilla. Beat until smooth, scraping down the sides of the bowl as needed. With the mixer on low, add the flour mixture to the wet ingredients in 2 additions, alternating and ending with the buttermilk. Scrape down the sides of the bowl after each addition. Beat until just combined (do not over mix). Add 2 tablespoons of batter to each tin. Bake for 20-22 minutes, or a toothpick inserted in the center comes out clean. Allow the cupcakes to cool in the tin for 5 minutes. Place a wire rack on top of a piece of parchment or wax paper. Transfer the cupcakes to the wire rack to cool completely. To make the glaze, add powdered sugar, lemon zest, and lemon juice to a small bowl. Whisk until the mixture is smooth. Drizzle the glaze evenly over the warm cupcakes, allowing the glaze to soak into each cupcake slightly. I just read your comment about the pink straw. Who needs pink when there’s lemon involved?! 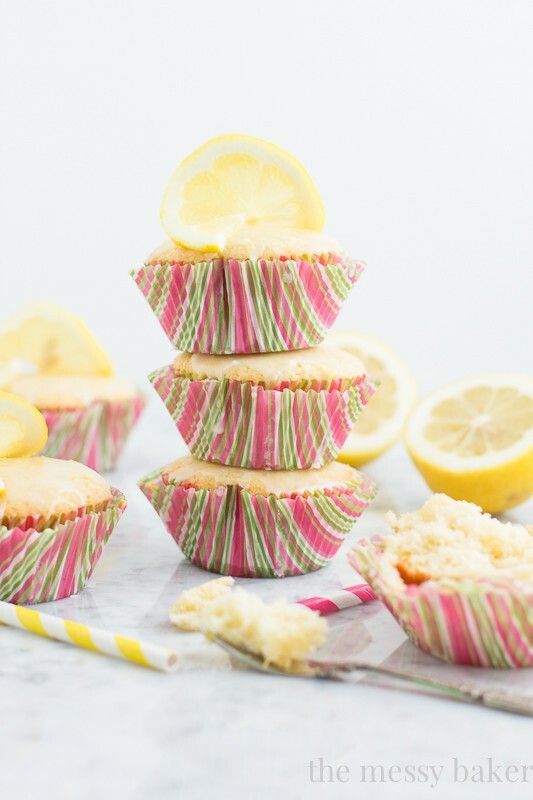 :) These are perfectly lemony and baby showery and… perfect! I agree, Erin. Thank you! I always prefer lemons over limes. These cupcakes are so bright and pretty! I bet the glaze makes them! Thanks, Laura! I really only use limes in my cocktail recipes. I hopped right over cinco too…I didn’t even eat a single taco, what the hey stack? Citrus fruit: why is it so expensive? One lil lime for $.99??? Makes me feel like I should move to So Cal and grow citrus trees in my back yard. And sell the fruit at the farmer’s market for $1 a piece. Supply and demand, baby…supply and demand. Anyway, these cupcakes: freaking beautiful!!! So psyched to be joining to for Georgia’s baby shower and high fives for being a little pink rebel! I winced when I saw the price. Seriously, it’s a lime, not gold. Cheers to being rebels! Thanks. I totally skipped out on Cinco de Mayo, too… but I think you totally made up for it with these delicious-looking cupcakes! These cupcakes are just so fun and delightful!! Thanks, Amy! Good luck with the unpacking. Such adorable cupcakes! And with all that lemon – ooh I so wanna reach into the screen and grab me one!! The limes – YES!! I sent my Hubby to get one just so I can garnish our enchiladas with it. He payed a dollar too! Craziness! So these cupcakes – so beautiful! I love lemon desserts and these are perfect! So happy to be celebrating Georgia and her baby girl with you, Jennie! Pinning! It’s a total bummer. I really want a margarita. Of course, now that I can’t have one, I want one even more. Thanks, Anna! These cupcakes look Ah-mazing! And perfect for a baby shower – refreshing yet still totally sweet and delicious! I had the same problem with Cinco here in GA…limes were 2 for $3! I almost fainted right there in Kroger. Thanks, Lindsey! Wow, you beat our lime prices. These cupcakes could make up for just about anything – they are lovely!! You are so very welcome. I’m happy I could celebrate this special occasion with you, even if it is only virtual. I wish you the best of luck, and I can’t wait to see pics! They’re all wrinkled and pale. One cupcake coming up :) Thanks! Haha, I skipped Cinco de Mayo too. This completely makes up for it ;) I am loving all your fun props in these photos almost as much as the cupcakes! The colors are so bright – these would make anyone’s day! I couldn’t believe the price of limes the other day either! Craziness. These cupcakes turned out beautiful though and the lemons on top look great! Me either. My knees almost gave out. Thanks! In my world, May the fourth overshadows Cinco de Mayo (even if SOME people haven’t seen the movie), so I didn’t celebrate either. But I didn’t realize that’s why limes were so expensive! I tried to buy some this weekend for daiquiri making, and that wasn’t happening. But I’m okay with these lovely lemony puffs of sweetness. They look perfect, Jennie! The limes are ruining everything good about cocktails. Thanks, Kim! Thank you so much, Uru! GIVE me all the cupcakes!!! I used to only like chocolate cupcakes, but now as a grown up, lemon has become once of my favorites. I love that little zingy burst of flavor! They’re all yours, Steph :) Thank you so much! These cupcakes are gorgeous! Love the lemon slices on top! I love me some lemon glaze!! And that is absurd pricing on limes!! Hopefully the crop gets better soon so we can have more limes!! Me too, Elizabeth! Thank you so much. These are so purty! What a nice surprise for Georgia! The lime situation really is quite dire!!! But at least if we can’t have limes, we can have lemons. And these lemon cupcakes certainly make up for it! It really is. I miss my margaritas. Thanks so much, Joanne! The price of limes is seriously cramping my style. It’s kind of ridiculous for that tiny little fruit!! I’m in love with these, so gorgeous! That’s the perfect way to put it, Dorothy. Extremely ridiculous, I agree. Thank you! Yup, just perfect for a baby shower!!! I’m so excited for Georgia!!!! Well, you KNOW I pinned these instantly. So beautiful, and SO much lemon flavor in every bite. And ugh, yes. This lime shortage. So tired of it already. Especially because my husband traveled to Mexico about five times for work this winter, and brought back a TON of awesome tequila every time. I’d been sort of hoarding it for “margarita season,” a.k.a. May-August. And now, here it is, can I can’t afford to make more than a few at a time. Blarg!